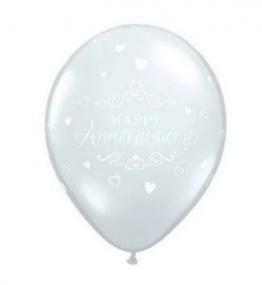 These clear happy anniversary latex balloons Qualatex balloons are of a professional quality and should float for up to 12 hours when filled with helium - they can be filled with air or helium. Each balloon measures 11" diameter when filled. Mix ivory with gold, white or pastel shades such as pink or lilac.